Katrina Six Months Later: Activists Discuss Grassroots Disaster Relief, Evictions, Racism and the Struggle to Help Those Left Behind | Democracy Now! Democrats have renewed calls for an independent investigation into the government’s response to Hurricane Katrina following the release of new video showing the Bush administration was warned of a catastrophe. On Wednesday, the Associated Press released confidential video footage of President Bush’s final briefing before Hurricane Katrina struck the Gulf Coast. The President was given dire warnings the storm could breach levees and threaten the lives of residents of New Orleans. Yet days later, President Bush said the breach of the levees hadn’t been anticipated. The news comes six months after Hurricane Katrina ravaged the Gulf Coast in what many call the worst natural disaster in US history. The storm displaced some 770,000 residents and destroyed over 300,000 homes. Nearly 2,000 people are reportedly still missing in Louisiana alone, at least 130 of whom are children. In the city of New Orleans, whole neighborhoods remain obliterated. In the city’s hardest-hit areas, such as the Ninth Ward, there is still no power or running water. Meanwhile on Wednesday, hurricane evacuees in nearly 3,000 hotel rooms nationwide were faced with a dreaded choice: either remain in their hotel and pay the bill with their own money or other federal assistance, or check out and find a new place to live. It was the last day FEMA directly paid hotel bills for many evacuees outside Louisiana and Mississippi. Storm survivors in about 7,400 hotel rooms in those states have been granted another extension through at least March 15. Jordan Flaherty, an organizer with the New Orleans Network. He is a longtime activist and editor of Left Turn magazine. Jordan was in New Orleans when the hurricane hit in August. He returned to the city soon after being evacuated to help with relief efforts and to report on what was happening on the streets, particularly to the poor, black communities that were most effected by the hurricane. Kevin Powell, long-time activist, journalist, and hip-hop historian. Powell traveled to New Orleans the week after the Hurricane and is currently helping to launch Katrina On the Ground, and initiative which will bring student delegations from around the country to the Gulf Coast to work with local aid organizations. AMY GOODMAN: We’re joined in our Firehouse studio by two people, by Jordan Flaherty, an organizer with the New Orleans Network, long-time activist and editor of Left Turn magazine. Jordan was in New Orleans when the hurricane hit in August. He returned to the city soon after being evacuated to help with relief efforts and to report on what was happening in the streets, particular in poor black communities that were most affected by the hurricane. And we’re joined by Kevin Powell, long-time activist, journalist, hip-hop historian. Kevin traveled to New Orleans the week after the hurricane, is currently helping to launch Katrina On The Ground, an initiative which will bring student delegations from around the country to the Gulf Coast to work with local aid organizations. We welcome you both to Democracy Now! JORDAN FLAHERTY: Thank you for having me. AMY GOODMAN: Kevin, let’s begin with you. What are you doing? KEVIN POWELL: Well, you know, we saw that, with the exception of a lot of local folks, like the brother sitting right here, a lot of our so-called national leaders have been really missing in action. I’m talking about elected officials, people who run civil rights organizations, etc. And as we were responding to Katrina with the benefits, folks going down there and whatnot, we said, you know, we need to do something that’s going to be very significant and probably in the sense of what happened in the 1960s, where you had a lot of students going down. A lot of college students were asking us, “What can we do?” And so, we put together Katrina On The Ground. We have about 1,000 students coming down. I know there are other students already down there, but this is actually going to start on a Sunday in Selma, Alabama. We’re going to train them every Sunday and Monday in Selma, and then they’re going to go to Biloxi to New Orleans and to Mobile, Alabama. AMY GOODMAN: So this is for their spring break? KEVIN POWELL: This is an alternative spring break. And part two, God willing, will be Freedom Summer 2006. We’ve been talking to a lot of people about that — I certainly want to get your information — because this is something that we feel has to bring the spotlight back to what’s going on. I mean, we were just fighting here in New York City the other day with the nine families being kicked out of the Kensington Hotel. Luckily, we got a stay, but you’re absolutely right. This is a problem that’s going on around the country in terms of social justice not being done for these displaced victims, particularly poor people in this country, and we’re not going to settle for that. AMY GOODMAN: Jordan, talk about on-the-ground efforts right now in New Orleans, the different groups and the different issues. JORDAN FLAHERTY: I feel like I learned a lot about what community means by living in New Orleans, and there’s a lot of amazing organizers, folks from what I would say is the Ella Baker school of organizing, who came up out of that movement and have inspired me so much and taught me so much. Great organizers that work with the People’s Hurricane Relief Fund, Common Ground Collective, Insight Women of Color Against Violence is starting a women of color resource center down there in New Orleans. Really amazing organizers who are doing really fabulous work, and folks from around the country have come to support us, which has been really inspiring, as well. And that is what’s inspiring, which we need, because we were let down by the federal government, by the state government, by local government, by the corporate media. All those folks let us down. You know, Bush knew — we didn’t need to see that videotape to know that Bush knew. Scientists knew. Journalists knew. It was in our local paper. It was on television stations. Everyone knew the levees were in danger. Everyone knew that we needed to do coastal restoration to protect the city. And Bush did nothing. He cut the funding for coastal restoration. He cut the funding for shoring up the levees. He did not care. And that’s why we need to do for ourselves and stand up and fight back. AMY GOODMAN: What are the key issues that people are organizing around on the ground right now? JORDAN FLAHERTY: Well, I’ll tell you who had a fast reaction time is the Heritage Foundation, the rightwing think tank. Within about a week and a half after the hurricane, they put out their agenda for their hurricane relief, and they said, “We need to cut the capital gains tax. We need to cut the inheritance tax.” And they also said, “We need vouchers for schools.” They’re attacking our school system, they’re attacking our healthcare system, they’re attacking public housing system. It’s this whole neo-conservative privatization agenda, and we’re being hit with it really hard. We had in Louisiana — it might be surprising for people to know — we were the only state in the country with a statewide healthcare system specifically for poor folks: the Charity Hospital system. And Charity Hospital in New Orleans served 66% of the uninsured folks in the city. That hospital was closed down under Katrina. Doctors went in, cleaned it out. They say the hospital is ready to be opened, but the hospital, the state is not reopening that hospital. The school system, we had 117 schools, there’s now just a handful open. Most of them have been charter schools, where students have been given vouchers. We are facing what looks to me something very similar to the end of open access public education in the city. It really looks like that. The vast majority of the teachers have been fired. For some students, things are going to get better, because some of these students are going to get into charter schools, which will be improved. And let me tell you, our public school system was not beautiful to begin with. But some students are going to get left behind. They’re going to be in the very few schools there left, and it’s going to get even worse for them. Housing, public housing, there are several thousand units of public housing that were not damaged, and yet they still have not been opened. Our At-Large City Councilman, Oliver Thomas, said the other day, “We don’t want any soap opera watchers in these.” The Housing Authority of New Orleans is going to set up testing. The people have to have job experience and training to go back into their homes, the homes that they used to live in. And, you know, we say, “What about the elderly? What about caretakers? What about women with children? Isn’t that work if they’re carrying with kids?” Apparently not to Oliver Thomas. So people are being kept out of public housing, and that’s a tragedy. I mean, it’s painful to me. Six months later, these units still sit empty. B.W. Cooper Housing Projects, after five months, they actually got broken into, and we might not find out who did the massive break-ins and stole people’s stuff, but the fact is, if people had been allowed to come back into their homes, there would not have been that widespread robbery. AMY GOODMAN: We have to break. We’ll come back to this discussion. Jordan Flaherty, long-time activist, editor of Left Turn magazine, organizer with the New Orleans Network; and Kevin Powell, long-time activist, as well, journalist, hip-hop historian, organizing spring break for hundreds of students coming from around the country and perhaps a new Freedom Summer 2006. AMY GOODMAN: This week, Mardi Gras celebrations did fill New Orleans at around half the numbers than usual. Every year, a group of African American residents dress up in elaborate Native American garb to pay tribute to the Native Americans who helped blacks during slavery. Democracy Now! producer Ana Nogueira was in New Orleans on Fat Tuesday. She spoke with Big Chief Alfred Doucette in the Sixth Ward at the Back Street Cultural Museum. He talked about the Mardi Gras Indians. BIG CHIEF ALFRED DOUCETTE: The Mardi Gras Indians, you know, like this is our tradition, we do this thing on Mardi Gras. We do this tribute to the Mardi Gras — I mean, to the Native American Indians for the time when, you know, slaves was trying to be free and they was running around, trying to find a place to hide, and the Indians took them in and gave them shelter, and this is a tradition that we try to keep going, just more or less giving praise to the Indians, you know, because like the Indians was about one and one with us, I mean, with the suffering and humility and all the stuff that they went through. You know, we went through pretty much of the same thing. You know, we try to keep it going. It’s just praise, you know. Thank you. Thank you for helping us get to this point, because we could have died off back in the days, but hey, here we are. This is 2006, after Katrina. New Orleans is in trouble. We are. We lost so much. A lot of our people haven’t come back yet, and our culture is thinning out. People are trying to hold people everywhere. For those of us that’s back in New Orleans, it’s happening. We’re making it happen. You know, this is my tradition. This is my town. I was born and raised here. I love New Orleans. New Orleans is in trouble, and it’s in trouble by man’s hand. Man needs to fix this problem, and I don’t see what’s taking them so long, because it ought to take in some money, you know, like Bush need to get off his hands and straight on say, hey, before another catastrophe happen, you need to go ahead on and give us this money, let us go on with our lives, put our lives back together. We’re going to spend the money back into the economy. I don’t understand why they won’t give it to us. I need a house. They gave me a trailer. I don’t want no goddamn trailer. I want my house back. You know, he just needs to get off his hands and say, well, I’m going to go ahead and give this to you, this money, let them go build their house, let them go buy a house, or let them go on with their lives before another catastrophe happen, and you know, it’s going to happen. I’m sixty-five years old. My life was set, and I was comfortable. You know, whatever years I have left, I would love to enjoy them like I was before Katrina. First Katrina, then come FEMA. I don’t know which storm was the worst. ANA NOGUEIRA: Where did you live? BIG CHIEF ALFRED DOUCETTE: I lived in the Eighth Ward. My street was 2608 North Rushablade Street. I’ve been staying over there four years. I bought that house, renovated it, I dressed it up. I thought I was set for the rest of my life. But you know, Katrina came. I’m not really blaming Katrina, because if the levees wouldn’t have fell down, I’d have been home a long time ago in my house. But the people that was hired to do their job didn’t do their job. By them not doing their job, they displaced a million or so people from their homes because of one person didn’t do his job. One person. That one person was bigger than a bomb. Look what he did to my state. You got to come around my house. I had six feet of water in my house. Three feet stayed for two weeks. I got a brown line in my house. It’s racism. It’s prejudice. It needs to stop. We need to come together as a people, because this city is screwed up and ain’t no one race of people going to fix it. They can bring all the Mexicans in here they want, but you don’t bring my people back in there, New Orleans is not going to be fixed. New Orleans needs to be fixed by the people that made New Orleans, and my people are scattered. They’re out there. They need to get them back home to fix the problem. We need this Mardi Gras more than any Mardi Gras we ever had. This town is dead. My area, Sixth, Seventh, Eighth, Ninth, east is dead. You can count the people that’s back in my neighborhood, and they got places for my people to be in my neighborhood, but they’re not allowing the people to come back. They’re keeping the gas out. They’re keeping the electric out. I came on, bought me a generator. I left on the generator for three weeks — $20 a day. That didn’t last too long, money wasn’t that long. You know, everything I accumulated in 65 years I’ve been here, I lost it, but I got my life. I got my health. I have a roof over my head. I have a few dollars in the bank. Still waiting on FEMA to do me what they’re supposed to do. I need money to live. Everybody need money to live. This town need money to live, okay? We got people come from everywhere in the country bringing money to this town. We need those people to come here to deposit money right here in New Orleans, the merchants, the business people, and put it back into New Orleans economy. We need them to come. No, we don’t have nothing to really celebrate, the people of New Orleans, other than asking people come back here to help us get our town back together. AMY GOODMAN: Big Chief Alfred Doucette in the Sixth Ward at Fat Tuesday, Mardi Gras. Mardi Gras Indians, African Americans of New Orleans honoring the Indians who helped the slaves more than a century ago. This is Democracy Now!, DemocracyNow.org, the War and Peace Report. He was speaking with Democracy Now! producer, Ana Nogueira. Our guests in the studio are Jordan Flaherty, who is working on the ground with various community organizers, and Kevin Powell, long-time hip-hop activist, historian, journalist, helped to launch “Katrina On the Ground,” an activist in the New York area who’s working to bring students to New Orleans, and Kevin, I wanted to ask you about up here what is happening to the evacuees in the hotels. You mentioned that you were trying to stave off evictions. KEVIN POWELL: Well, you know, this has been going on the last three or four months. This is a group that we’ve been working with called Family Dynamics. It’s a New York City coalition supporting evacuees who are here. And just the other day, got an urgent call that nine families were going to be evicted from the Kensington Hotel, which is right on the border of Queens and Brooklyn? Literally, people are scattered all over the city as you can imagine. AMY GOODMAN: Near Kennedy airport. KEVIN POWELL: Exactly, and so, you know, we got a stay of that eviction, but God knows this is a week-to-week process, and part of the problem, as Jordan was alluding to, there seems to be this kind of Katrina fatigue in this country, from the top down, where folks are not very supportive of these people. They don’t understand that there’s a difference between charity, giving one time, feeling good about it, and justice, which means this has got to be something we do ongoing, because we’re talking about issues of race and class in this country, and the fact these people’s lives are not valued because they’re black, because they’re poor, you know, because they lived in the Ninth Ward, because they lived in places like Iberville, and so part of Katrina On the Ground is to say, “We’re going to bring the spotlight back to this thing,” and you know, this is going to go on for as long as necessary. AMY GOODMAN: What do you mean the reproductive rights of women being attacked? AMY GOODMAN: Oh, in general. KEVIN POWELL: Yeah, Roe v. Wade being eroded, and so what we’re trying to say to people, it’s not just about Katrina; it’s not just about New Orleans. This is about democracy in this country, and we need you to bring all these different social justice movements together. Otherwise it will continue to be this kind of isolated thing. You’re doing your thing. I’m doing my thing. We’re saying, '“No, this is a serious, serious time we're living in,” and clearly, as was reflected that in that video with Mr. Bush a couple of days ago, these folks absolutely do not care what happened down there. AMY GOODMAN: Jordan Flaherty, the color of New Orleans now? JORDAN FLAHERTY: I think we’re seeing American racism on hyperdrive right now, with mass dispossession of people from New Orleans. I’m white, and most white folks I know are back in New Orleans. Black folks are not back. Even if you compare similarly destroyed neighborhoods, like the Lower Ninth and Lakeview, right? Lakeview is mostly white, and people are coming back, by and large. People are rebuilding. The Lower Ninth, you know, is not back. And so, it’s definitely, you know, it’s a racialized disaster. AMY GOODMAN: And the voting? Last week, a federal judge ruled against a request for the State of Louisiana to create out-of-state satellite polling places for evacuees temporarily living outside Louisiana, and New Orleans is scheduled to hold a primary election in April. What does that mean? They don’t participate in the rebuilding of their city? JORDAN FLAHERTY: Exactly. I’m not a big believer in electoral politics, but one way that you dispossess people of a city is you take away their voting rights. And we were able to allow Iraqis living in the U.S. to vote in the Iraqi elections, but we can’t allow the New Orleans people dispersed around the U.S. to vote. This idea, “Oh, they can do absentee balloting”? If you’re moving from place to place to place, then you’re not in one stable address, and that’s what almost everyone from New Orleans is facing, they can’t do the absentee voting. They can’t do that, so we need satellite voting, and it’s being stopped. KEVIN POWELL: And real quick, six months after you’re away from a residence, you’re no longer a resident in a lot of ways in that particular area, and so these folks probably won’t even have the right to vote in New Orleans, because it’s been more than six months when April comes around. So we’re talking about folks not even being able to participate in who’s going to be the mayor and city council of that city. AMY GOODMAN: What about the prisoners? We were focusing on this a lot after Hurricane Katrina hit. First, what happened to those who were incarcerated at the time that the water was rising in the prisons? But what about where the prisoners are today? Jordan Flaherty? AMY GOODMAN: What do you mean, only seven left? JORDAN FLAHERTY: The rest have all been laid off. The city didn’t have money for them, and those that are left, a lot of them don’t have phone service, fax service, the things they need to properly represent their clients, so these people are not getting representation. They don’t have any time on the horizon, the chance of even having a court hearing, and I want to remind the Law & Order viewers out there, that just because someone’s been arrested doesn’t mean they’re guilty. Just because they’re convicted doesn’t necessarily mean they’re guilty, but definitely these folks have not been convicted of any crime. They have not had their day in court. They’re just being shuttled off to these prisons, and it breaks my heart. Many of the people who were in misdemeanors have just gotten out now. So these are people who were there for public drunkenness or unpaid parking tickets. They spent several months without getting their day in court. It’s heartbreaking to see, and it’s being ignored by the media. AMY GOODMAN: And where are these prisoners? JORDAN FLAHERTY: They’re at Hunt Prison, Angola Prison, which a former slave plantation, where 90% of the prisoners there end up dying there. It’s, you know, for death penalty and life-in-prison places. People still do the plantation labor; they still cut sugar cane there at that prison, and that’s where far too many young black men from New Orleans have ended up historically. And I want to give a shout out to Safe Streets, Strong Communities, which is a coalition of groups in New Orleans that are working on this issue and organizing on this issue. Organizations like Critical Resistance, at CriticalResistance.org, and people can see more of those organizations at the magazine I work for, LeftTurn.org, which also has more coverage of that, also NewOrleansNetwork.org. And I also want to say that ReconstructionWatch.org has had a great coverage of breaking down the facts, and they call them Mardi Gras index, of all these facts on education, prisoners, healthcare, all that. AMY GOODMAN: If people are diving for their pens right now, we’ll link it all at DemocracyNow.org, but what about public schools and also the universities? Tulane opened up, but there were also the historically black colleges that were hit very hard. JORDAN FLAHERTY: Absolutely, and you know, we have seen such a — I mean, it’s heartbreaking for me to see on every level the way our education system has been hurting, but one thing that’s interesting, I want to say, about Tulane is 90% of Tulane students came back. Now, people keep saying that we have to be realistic, that New Orleans people don’t want to come back, that they won’t come back. These students, who had much less of a link to the city, they came back because they were welcomed and they were encouraged to come back. The people of New Orleans have been kept out. Dillard, which is a historically black college, still 80% of those folks came back. KEVIN POWELL: It’s absolutely untrue that people don’t want to come back. We’ve talked to residents all around the country. They just don’t know how they’re supposed to get back. They don’t have the information. They have this sense they’re not wanted back in their communities. And as you said, this is a whole racialized natural disaster, and the response has been racialized. One thing I need to add is that what’s been frustrating for us as organizers of Katrina On the Ground is the fact that foundations, corporations, certain people who call themselves leaders in this country, be it elected officials, civil rights leaders, have completely turned their back on the fact there’s no plan, no real plan to help these people down there. AMY GOODMAN: Your website, Kevin? 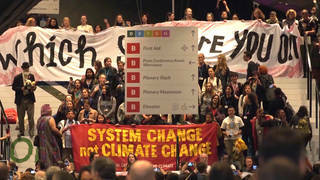 AMY GOODMAN: And the students head down? KEVIN POWELL: March 5th, Sunday, March 5th to Selma for training, and then they’re going into New Orleans, Biloxi and Mobile, and they’ll be going down all month, and as I said, part two throughout the summer of 2006. AMY GOODMAN: Well, I want to thank you both for being with us, and we’re going to follow what those students do. JORDAN FLAHERTY: Thank you for keeping the coverage alive. AMY GOODMAN: Jordan Flaherty, long time activist and editor of Left Turn magazine; Kevin Powell, long time activist, as well, currently helping to launch Katrina On the Ground.